April 11, 2019 April 11, 2019 by Vinay Leo R.
Mythology has been a big part of my childhood, having either read them in comics/books or been narrated to me as bedtime stories. So any book that falls in that genre has both an advantage and a disadvantage with me as its reader. The advantage is that it is a genre I’m partial to, so the likelihood is that I will like it. The disadvantage is that because these are stories close to my heart, if it isn’t done justice, I’ll have no hesitation to hate it. 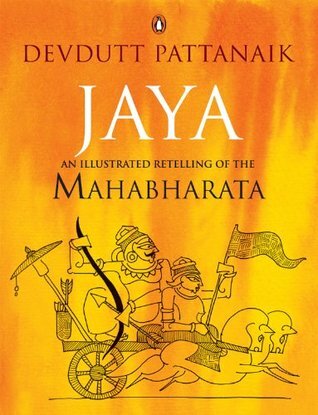 Jaya is the first book of Devdutt Pattanaik that I picked for reading. I chose it because it was an illustrated retelling of the epic Mahabharata and I hadn’t actually read an illustrated version till then. The book is different from any retelling of the epic because it isn’t exactly a complete unabridged style of narration. The author shares the epic’s important events in a crisp yet descriptive manner, and then follows each part with some of his own thoughts, different versions of the event in different folklore etc. His illustrations are different too. Though the retelling happens in small crisp parts, I didn’t feel that the magic of the original was lost. I felt there was beauty in his words, which makes the epic come alive, just as it had when I read it in my childhood days. The illustrations help that a lot as well. I don’t claim to know every bit of mythology when it comes to this epic, so it was nice to read and learn about some events. And the shortened version of the Bhagavad Gita was easy to understand. Whether one loves the author’s commentary or not might vary with the reader. I didn’t find that part off-putting, so it didn’t make a big difference to my reading of the book itself. It might even have left some food for thought. Is this book a perfect retelling? Possibly not. But I feel it comes quite close to it. There is magic, and there is understanding of the tale. This opinion will vary because each reader will have a different level of knowledge about the Mahabharata. I’ve recommended this book to many, and those who have read it have also loved it a lot. And this is a book I will re-read often. Fascinating. I love mythology, too, but have never read Indian stories. Thanks for the recommendation! I found you through AtoZ. Stop by and visit some time – I’m doing a new story for each letter. I enjoy reading Devdatt Pattnaik – not so much the Mahabharata. Such a long, convoluted and tragic story – it has never appealed to me. Glad to have found your blog. I’ve not read the unabridged version of the Mahabharata, so I don’t know if it is long, convoluted. I guess an epic might be just that of course. 🙂 Thanks, Kalpana.